"Although athlete's often get "athlete's foot," it is important to remember that anyone can get it. Athlete's Foot is also known as a "ringworm of the foot" and tinea pedis. It is the most common fungal foot infection. 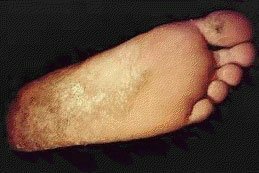 This disease is a skin infection caused by a fungus, usually occurring between the toes or on the soles of the feet. The reason this condition occurs more on the feet is due to the heat in the shoe, lack of sunshine and sometimes sweating that occur more in the foot. Some of the symptoms include itching, flaking, and scaly skin that could often could form into a blister. It may often lead to peeling and cracking between the toes or excessive dryness on the soles of the feet. A group of mold-like fungi (dermatophytes) causes these infections. These organisms are normal inhabitants of your skin and their growth stays normal as long as your skin stays clean and dry. However, dermatophytes thrive in damp and closed environments. Athlete's foot prospers in thick, tight shoes that squeeze the toes together and may ultimately create warm, moist areas between them. In addition, wearing damp socks and shoes as well as humid conditions indulge the organisms' growth. Plastic shoes especially impart a welcoming environment for fungal growth and infection. In order to prevent Athlete's foot from occurring, Dr. Ravaei makes certain that his patients remember to always dry their feet after contacting water. It is necessary to change your socks daily and to wear comfortable shoes that don't cause your feet to become sweaty. Although Athlete's Foot is contagious and can be spread by contact with an infected person or a contaminated surface, it can often be treated with over-the- counter antifungal medications. Some of these treatments include medications to terminate the fungus, medications to stop the sweating and itching of the feet, and the change of foot wear. Quite often over the counter medications do not help, should that be the case, Dr. Ravaei places the patient on a combination of medications. These medications will treat the patient in a short while. It should be noted that this condition can return, should that be the case, the patient needs to return for additional treatments.